In these recent years, the development of power unit for wrist watch is unbelievably progressing. 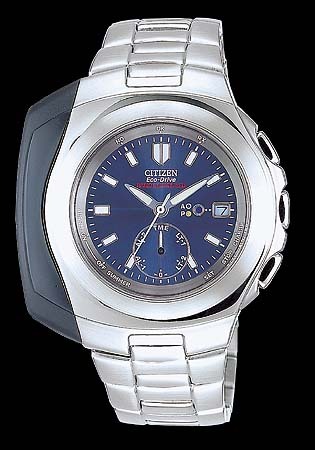 Citizen has been challenging products applying the solar cell system "ecodrive" of clean energy. This radio wrist watch with built-in power unit of the very kind can automatically revise time display via radio of standard domestic time. In this manner, we can know accurate time anytime and anywhere we wish. Because not only time but also date can be modified likewise, the user does not have to worry about changing battery nor revising time and date. The solar cell system power unit and radio watch are both long selling products, yet, this wrist watch is the first case of their marriage in the most sophisticated design.